The jojoba plant is native to northwestern Mexico and southwestern USA as it grows in the Sonora desert. The first to have used jojoba in therapeutic and cosmetic applications are the Natives of this region, now called California, Arizona and northern Mexico. They discovered its qualities to alleviate skin problems, for scarring and scrapes and for other injuries and bruises. They also attributed to jojoba oil virtues to soften the skin and protect it from the sun but also as a choice ingredient for a healthy and silky hair. In addition, jojoba seeds, containing 30% protein were part of their diet. It was not until 1970’s that scientific research on jojoba oil took off, and this product began to appear in many cosmetic products. Previously, sperm whale fat and petroleum substances were the main ingredients of cosmetology and pharmacy. The ban on whaling for industrial purposes and the oil crisis have prompted pharmaceutical and cosmetics designers to seek a sustainable, renewable and more ecological solution. Jojoba is a must for protecting the environment, plant and animal worlds. The jojoba, a bushy shrub, with beans containing seeds, from which the oil is extracted, is grown in arid regions. The roots, which can measure several meters, know how to guard against the lack of water. In the addition to the Sonora desert, we can now find jojoba plantations in Argentina, Peru, Australia, Egypt, Israel and the arid zones of Africa. In addition to providing interesting oils, its cultivation helps to protect the soil. The jojoba seed, in addition to containing proteins, consists of 2/3 oil. Scientists have discovered that it is the substance that comes closest to human sebum, which is why it harmonizes so well with the skin and hair. On the skin, jojoba has surprising effects and adapt to all types. It protects hydration by preventing water loss from the skin cells. It nourishes the skin without leaving a greasy film on the surface. It re-balances the production of sebum, is calming and healing, softening and slows down the aging effects by activating the metabolism of elastin thus bringing flexibility and elasticity to the skin, smoothing and firming it. It is also a good treatment, if used continuously, for eczema and psoriasis. On the hair, this oil adapts to greasy hair as well as dry hair, to natural hair as to treated hair. It is also an ally of the scalp as it helps to regulate the production of sebum and reduces the appearance of dandruff. This oil is rich in vitamin E, thus has the power to delay the appearance of free radicals that are responsible for premature aging, and thus the appearance of white hair. 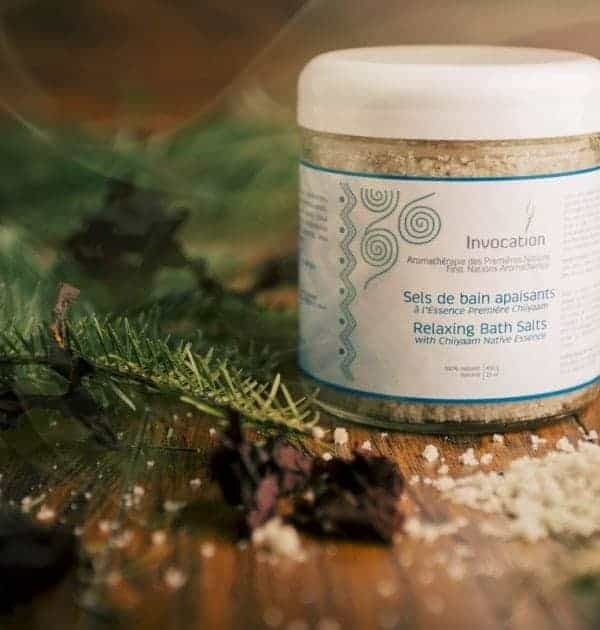 In our bath salts with the CHIIYAAM essences, jojoba oil is included in its organic form, without additives, having retained all its biological properties and whose therapeutic effects are not altered. In this way, the drying effects of a salt bath are neutralized in addition to leaving the skin silky, without any fat film on the surface. With the essences of CHIIYAAM and Brittany sea salt, jojoba oil makes for a complete product, geared towards optimal relaxation and regeneration. Why are the CHIIYAAM essences bath salts so efficient?